What are you really looking at when you gaze at a color TV screen or a newspaper photo? On a TV screen or in a newspaper or a magazine picture, or even the computer monitor screen on which you read this text, the images are formed by groups of red, green and blue dots or “pixels” (short for picture elements). In the case of a conventional television display, the groups of dots glow in varying degrees of brightness and hues, triggered by electrical pulses from the TV set's electronics. These pulses perfectly track the signals broadcast by the television station or cable system that routes the TV signals into your home. Lines and Lines The 60-year-old analog TV system all of us grew up watching is based on 525 horizontal scanning lines, although only 480 lines are actually used to scan the picture from top to bottom across the TV screen every 1/30 of a second. A single frame of TV is composed of two “fields” of 240 lines each, presented every 1/60 of a second, which are “ interlaced ” or interwoven to form a full picture every 1/30 second. This happens so quickly that our eyes blend the 60 still fields together into 30 frames (each frame is a still picture) and we see only continuous motion. Definition: Standard and High Because the image is composed of 480 interlaced lines, the system is called 480i, and is known as standard definition in the world of digital TV. A DVD image represents standard definition. The number of scanning lines determines the amount of detail in the image (vertical detail, because the horizontal lines are stacked from the top to the bottom of the screen). Understanding this process will help you understand the differences in clarity or resolution (sharpness) between regular analog TV and digital TV, including High Definition TV (HDTV). Incidentally, just because a new TV is “digital” does NOT mean it is HDTV. Although all HDTV pictures are digital, not all digital TV is high-definition, because the North American Digital TV standard, established in 1995 by the Advanced Television Systems Committee (ATSC), enables 18 different formats and various levels of clarity— Standard Definition , Enhanced Definition (EDTV), and High Definition (HDTV). Wide or Square A standard definition picture can be viewed in the familiar 4:3 (almost square) format or in a widescreen 16:9 aspect ratio (the width-to-height ratio of the screen). You may have noticed the different screen shape of most new digital TVs. The clearly rectangular 16:9 screen is the standard for digital TV, and more closely approximates the theatrical screen shape of most movies made since the late 1950s, when widescreen film processes like Cinemascope and Panavision became popular. (Sony, Panasonic and a few other major brands still offer some new digital HDTV-ready sets in the boxier 4:3 screen shape, but eventually all new digital sets will be widescreen.) All high-definition programming allowed by the ATSC hi-def standards is widescreen as well. Details, Details By adding more scanning lines from top to bottom, either interlaced or progressive, more detail results in the picture. Some of the US networks (CBS and NBC) broadcast HDTV with 1080 interlaced lines (1080i); ABC uses 720p or progressively scanned lines. A digital TV must, by law, be able to display any of these transmission standards, including 480p and 480i, but you may get only standard definition clarity. Many digital TVs are not capable of displaying full 1080i or 720p HD signals, particularly the least-expensive flat-panel LCD and plasma sets. These sets may only work at 480p and will convert or “scale” any incoming signal to 480p—still much clearer than analog TV, but not as dramatically improved as a digital set that will display the full HD 720p or 1080i scan rates. We've talked about vertical detail determined by the number of scanning lines, but there is also horizontal information in a TV image. The number of dots or pixels across the screen will determine the horizontal detail of a standard or high-definition image. Standard definition may have 704 pixels across the screen. A 1080i HDTV image can have 1920 pixels while a 720p HD image may have 1280 pixels. Don't get bogged down in the number of pixels! An HDTV picture in 1080i looks roughly as pleasing and clear as one in 720p. Progressive scanning produces a smoother, more film-like look, but a 1080i image actually contains greater detail. Each is sometimes better suited to different subject matter. Though it has fewer lines, the native progressive scan format (720p) eliminates motion artifacts that originate in interlacing, and are still visible in 1080i viewed on a large screen. For subject matter that contains a lot of rapid motion—Monday Night Football, basketball or hockey games, for example—720p will produce a clearer, more stable picture than 1080i. Alternatively, for subject matter that has very little motion, 1080i is capable of rendering more picture detail. Both, however, can be visually stunning, up to five times as clear as your old analog TV picture. Nevertheless, with HDTV programs in either 1080i or 720p, you'll see individual blades of grass, the makeup on actors' faces, even the scratches on a news anchor's desk. But the beauty and wonder of high-definition images have an almost hypnotic effect, even after repeated viewings. Nature documentaries are like being there. (Don't even discuss VHS and VCR images, which at best produce about 240 lines of resolution. That's why VHS videotapes always look somewhat “soft” and out of focus, even compared to conventional analog TV broadcasts.) In terms of clarity and detail, HDTV is to conventional analog TV like DVD is to VHS videotape, as big an advance in TV as the switch from black and white to color broadcasting 50 years ago. And the Sound? The audio standard for all SD, ED and HDTV digital programming is Dolby Digital, which means it's a digital audio signal of at least two channels and in many cases, six (Dolby Digital 5.1 surround). It seems logical once you've upgraded the video image to high definition, to match the video with an upgraded audio experience: a home theater surround system capable of comparable fidelity and clarity. No matter what signals you feed into a digital TV, interlaced or progressive-scanned, the digital TV will “up-convert” or “line-double” the signal so it can be displayed. 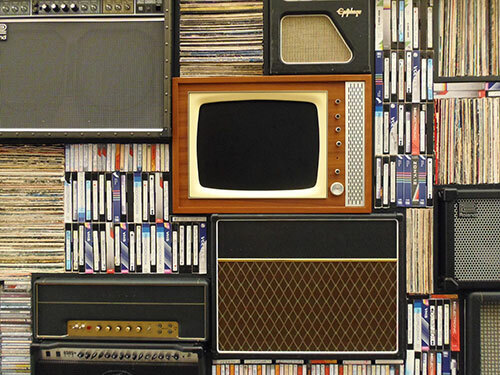 That doesn't mean that videotapes from your old VCR, laserdiscs or conventional broadcast TV programs will have high-definition detail and freedom from noise. 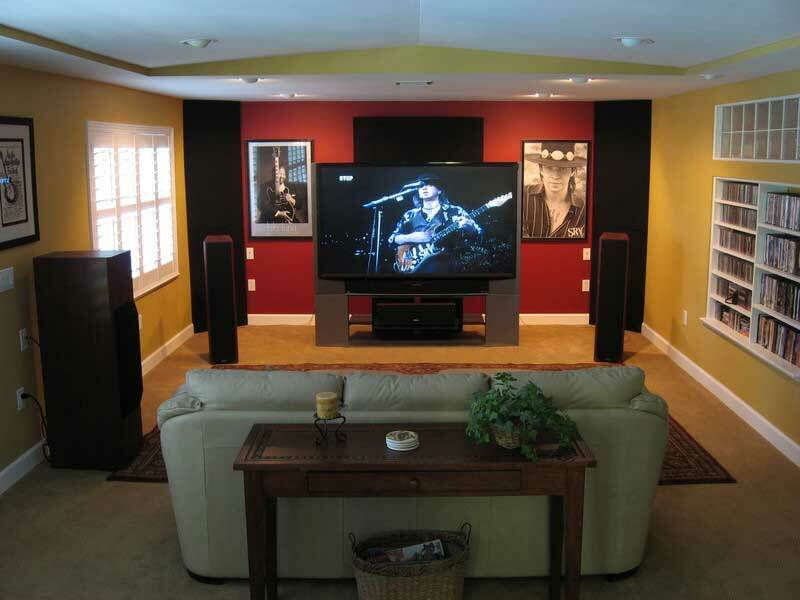 Depending on how effectively the conversion is done by the set, some of those signals may look better or a lot worse when they are enlarged and line-doubled, so don't sit too close to a large-screen HDTV if you are watching old videotapes, laserdiscs or non hi-def TV programming. But with 480p DVDs, 720p and 1080i HDTV broadcasts, you may indeed sit much closer to the screen than you would with old programming on an analog set. A very rough rule for viewing distance is to double the diagonal screen size for HDTV or DVDs on an HD set, and triple the diagonal screen size if you are viewing non-HD signals or conventional analog broadcasts. That applies equally to direct-view, flat-panel and rear-projection TVs. Receiving HDTV Speaking of video signals, how do you receive HDTV broadcasts? The three most common methods are via satellite-TV set-top box, a cable system set-top box, and over-the-air (terrestrial) reception from a digital HDTV broadcast station. Most digital HDTV and EDTV sets are “monitors,” lacking an internal HDTV tuner for terrestrial reception by antenna. If that's what you want and you are within range of an HDTV station, then you must buy an outboard HDTV tuner that connects to your monitor or one of the “integrated” HDTV sets that contains its own digital HDTV tuner. But if you prefer satellite TV or cable reception, you don't need the extra outboard HDTV tuner because the satellite tuner or cable set-top box performs that function for you. You must make certain you specify an HDTV-ready satellite or cable set-top box, however. All progressive-scanned HD, ED, and SD images are connected through component video cables; some satellite and cable set-top boxes also have new DVI (Digital Video Interface) connectors, which conduct the digital HD signals directly to the set. An even newer type of digital video connector—smaller than DVI, more like an overgrown USB jack—is HDMI (High Definition Media Interface). It carries Dolby Digital sound as well as digital video, and is beginning to appear on new HDTV sets this summer. Adaptors from DVI to HDMI or vice-versa are already available. Lots of Time Consumers are moving to HD-ready large-screen sets and projectors in unprecedented numbers, almost as fast as DVD players replaced the VCR and videotape. Large-screen rear-projection TVs and direct-view HD-ready sets and flat-panel displays are the fastest-growing sales category in electronics stores and chains. The transition to full digital HDTV throughout North America likely won't be complete until 2010 or so, so you still have plenty of time to chew over which type and how big an HD display to buy, as well as whether you want to stick with the familiar old 4:3 screen shape or go for the widescreen 16:9 sets. In a future article, I'll explain the differences and trade-offs inherent in different TV display technologies—CRT, DLP, LCD, rear and front projection, plasma and LCD flat panels. If you can't wait, you can read my brief overview here.